It is interesting how your animal becomes a part of your family. How they seem to mimic the words they hear or seem to know what you are thinking. Such was the case of Bear our Blue Point Siamese. He was the traditional Siamese in appearance but there was those things that made him unique to being Bear. We raised him from a tiny kitten having been abandon by his mother. He took to the bottle feeding and to my husband as well. As a kitten, up my husband's pant leg he would climb just to be in his arms. He loved to purch on the back of the recliner or sit in my husband's lap snuggled in the the furry warm throw and stay pleasantly warm. Sometimes Bear wouldnussle next to my husbands face and beard, and gently groom it as if it was another kitty friend. When you played with him with his string stick toys he would jump and flit like the acrobates seen at a circus...but at his level of course. When reading the newspaper you can expect for Bear to be right there looking to have his page where he hid under it as if it was his tent. And yes, Bear even had his own "Teddy Bear", nearly as big as he. Bear would drag it from room to room to keep him company when his family tended to the daily routines or chores. Bear talked up a storm when you came into the room,rather than the traditional "meow" and my husband said he could distinkly hear "mom" if I was coming in. Bear could be a bear if you avoided noticing him, would jump up next to me where I may be sitting and nip me on the arm...it was his time to play. When reading or watching a program on TV you could feel that something was watching you and yes it was Bear. He had been staring without a blink for many moments on end. We think he had been reading your ever thought that came through your facial expressions. At super time he would find a chair just pushed far enought away from the table to pick his little head through. If he thought Pop wasn't looking he would sneak his little paw to the table as if wanting to shake your had for a morsel of food. Being caught in the act and told to "take your paw off the table". His response was a vocal sound like a child sassing back...yet he politely responded. 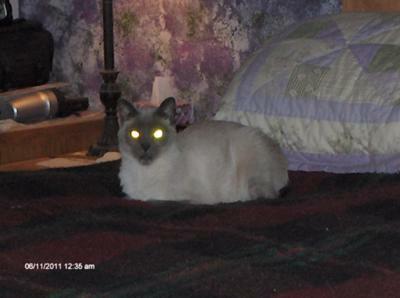 We miss this Bear as he passed on in September 2011 and hope to soon find us another forever "Siamese Friend"!